Pinterest has a means of verifying or “claiming” your website on your Pinterest Business Account. (If you don’t have a Pinterest business account, you can get on quickly or convert a private account.) This is a simple thing to do and a very valuable aspect of your business account SEO. It’s just good sense to claim your website on Pinterest. And now you can also claim more than just your website. 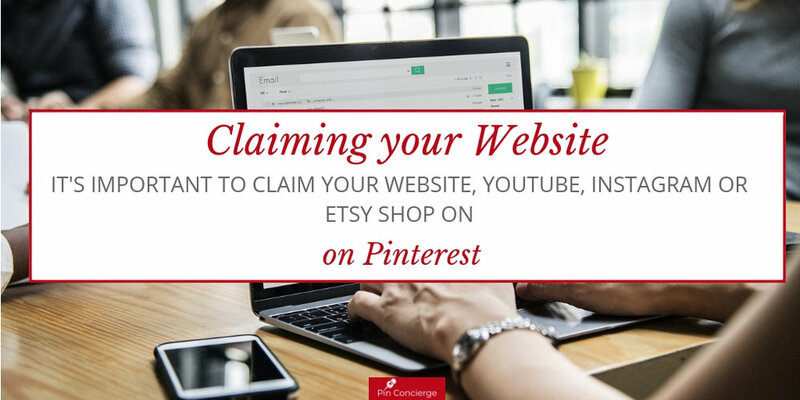 What does it mean to claim my website on Pinterest? On Pinterest, your Profile has a website link directly below your profile photo or logo (see image). You can put any web address there, but you can only claim a site you have access to adding html code. This signals Pinterest that the account owner also owns the website. It’s a stronger link between the website and the platform. Are there benefits to claiming my website on Pinterest? The benefits of claiming a website are simple. How do I know if my website is already claimed? If you website has been claimed by your account. The globe and check mark symbol will appear next to your website link in your profile. That simple. If your website is already claimed, you can stop reading this article and instead learn how to get in the Pinterest home feed instead. How do I claim my website on Pinterest? If your website is not already claimed. Here are step-by-step directions for claiming it. 4. Put in your website address. That step just got a bit hard. If you are concerned about finding your code in your website. Every major platform has directions for this. See the end of the post for major web platforms including, Wordpress, Shopify and Squarespace. It says it can take up the 24 hours. It seems to take much less than that most times, but in the odd case it’s the next day. Either way, if it worked or didn’t, you will get an email. Pinterest recently introduced claiming YouTube Channels, Instagram accounts and Etsy stores. This is pretty great news. Now whenever a pin is created from your YouTube account or a pin is made from your Instagram account your profile image will appear next to it and Pinterest will know just a little bit more about who’s pin it is. And remember every bit of data extra you can give Pinterest to tell about what the pin is and who should see it will help in the search ranking. 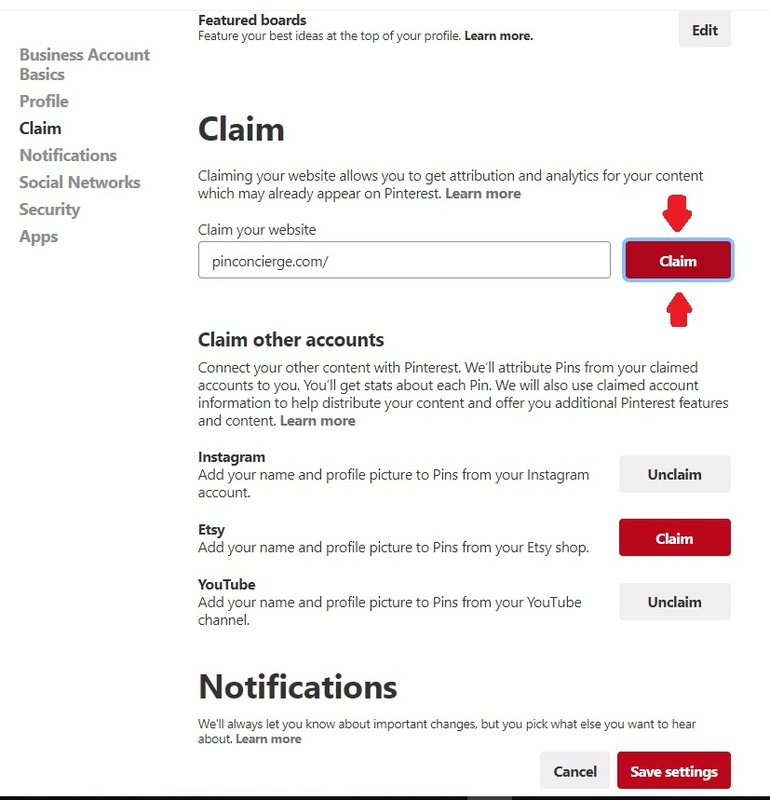 To claim your You Tube account or Instagram you will need the account log-in information. Grant account permissions to Pinterest. Sometimes the settings page doesn’t update. So be sure to reload the page before trying again. That’s it. That is claiming your website on Pinterest. This is a valuable aspect of domain authority within Pinterest. Which if you need to know more about check out the concierge post on Pinterest Keywording. If you want your account set up and this sounds to complicated please email a concierge for details. How to specifically access a sites <head> section of code.